Jeju Island, a subtropical island that sits below the Korean peninsula, is known to vacationing mainlanders as a romantic getaway, and to Robert Redfod, Gloria Steinem, and the Global Campaign to Save Jeju Island as the site for the construction of a South Korean naval base that has met fierce resistance from local villagers. The resilient descendants of these villagers and a brutal massacre that wiped out 30,000 to 60,000 islanders in 1948—a horrific prelude to the Korean War—lie at the tragic center of Jiseul. Smoke, whether from burned villages or from inside the cave, figures heavily into the film. It prevents a clear view of the characters or the suppressed history that has been entombed along with their ashy remains. This is a denser fog of war than most American audiences are accustomed to; the Korean War is called by some as “forgotten” and others as “unknown,” but the violent period between 1945-1950, marked by the Jeju Massacre, is enshrouded in a darkness as pitch-black as the refugees’ cave. In many scenes all we hear are their voices; their voices are the voices of ghosts, straining to reach us through heavy folds of enforced silence, curling into the air like smoke signals. In one scene that captures the conflict between enduring Korean social relationships and a reductive, destructive Cold War logic, an elderly woman sits dying on her home floor, inches away from the commander who just stabbed her. “How old are you, dear?” she asks weakly, her face splattered with her own blood. “Why do you need to know?” he answers. “I have a son around your age,” she says. “Yeah? My mother died in commie hands,” he says. “I really hate commies.” As he leaves, we hear the flickering of flames that are about to engulf the house; we see the elderly woman vainly reaching out to a pile of potatoes to save them for her refugee son. It’s a moment of both tragic futility, nourishing generosity, and quiet resistance. Jiseul is a bleak, yet beautiful film. O Muel has crafted a masterpiece that pays homage to the lives that were killed and to a divided nation whose incomplete liberation has yet to come. Jeju Island is a subtropical island that sits below the Korean peninsula and is known to vacationing mainlanders as a romantic getaway. But to Robert Redford, Gloria Steinem, and the Global Campaign to Save Jeju Island, it's the construction site of a South Korean naval base that has met fierce resistance from local villagers. The resilient descendants of these villagers and a brutal massacre that wiped out 30,000 to 60,000 islanders in 1948 -- a horrific prelude to the Korean War -- lie at the tragic center of O Muel's Jiseul. Jiseul's imagery and symbolism are significant, particularly in the historical context of war and conflict on the Korean peninusla. Smoke -- whether from burned villages or from inside the cave -- figures heavily into the film, obscuring the view of the characters and the suppressed history that has been entombed along with their ashy remains. This is a denser fog of war than most American audiences are accustomed to. The Korean War is referred to as “forgotten” and “unknown,” but the violent period between 1945-1950 -- marked by the Jeju Massacre -- is enshrouded in a darkness as pitch-black as the refugees’ cave. In many scenes all we hear are their voices, the voices of ghosts straining to reach us through heavy folds of enforced silence and curling into the air like smoke signals. 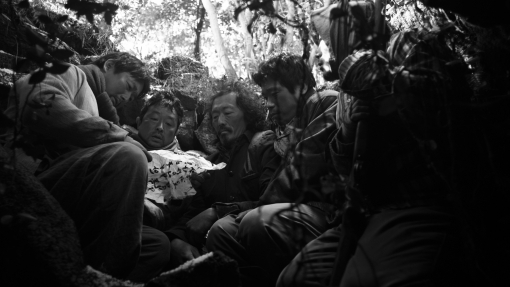 One scene captures the conflict between enduring Korean social relationships and a reductive, destructive Cold War logic: An elderly woman sits dying on her home floor, inches away from the commander who just stabbed her. “How old are you, dear?” she asks weakly, her face splattered with her own blood. “Why do you need to know?” he answers. “I have a son around your age,” she says. “Yeah? My mother died in commie hands,” he says. “I really hate commies.” As he leaves, we hear the flickering of flames that are about to engulf the house; we see the elderly woman reaching out in vain to a pile of potatoes to save them for her refugee son. It’s a moment of tragic futility, nourishing generosity, and quiet resistance. Jiseul is a bleak, yet beautiful film. O Muel has crafted a methodical masterpiece that pays homage to the lives that were killed and to a divided nation whose full liberation has yet to come. Jiseul screens on March 15 at 7:30 pm and on March 19 at 8:30 pm at Sundance Kabuki Cinemas. Check out all of Hyphen's CAAMFest 2013 reviews.